Home / Reviews / VyprVPN Review 2016: Does this provider have bite? VyprVPN Review 2016: Does this provider have bite? VyprVPN offer a robust and reliable service that will be suitable for beginners and experts alike. Very simple software & apps. PC, Mac, iOS & Android clients. VyprVPN owned by GoldenFrog are one of the largest VPN providers available these days but is their service actually any good? I reviewed VyprVPN back in 2015 and 2014 and found their service to be favourable and robust. As the VPN world changes rapidly I’ve been taking a look at their service in recent weeks to see if it’s still keeping pace with the mass of competition out there. So read on to find out if VyprVPN still has their bite or if they’ve whimpered into the grasslands in this VyprVPN Review 2016. VyprVPN is usually known for the value added services it bundles with its VPN package and it’s something personally I’m not a massive fan of. Thankfully in the last year they’ve started to drop these additional services such as their Dropbox equivalent, Dumptruck and now mainly concentrate on offering you the VPN service that you’re no doubt after. Unlike most other VPN providers VyprVPN have different packages available which in a nutshell differ in VPN protocols available, how many simultaneous connections are possible and if the service has a NAT Firewall included or not. Unless you only want to access geo-restricted content then the VyprVPN Basic package is generally not a great option as PPTP isn’t enough these days to protect your online security. So considering the Pro or Premier package is your best option. The monthly prices from VyprVPN border on the ridiculous considering what the competition offer for much less. However, saying that you can save up to nearly 50% off the per month prices by taking an annual package which is well worth the money. Overall VyprVPN is still slightly on the higher end price wise even when taking an annual package but to off-set this VyprVPN do offer a 3-day trial which if you cancel before the trial period ends you won’t be charged at all. This in itself is unique as most providers charge first and require you to use their money-back guarantee if you’re unhappy. VyprVPN offers a full range of VPN protocols when taking their mid or upper package which includes PPTP, L2TP/IPsec and OpenVPN. One of the bonuses of the VyprVPN service is they also offer a proprietary VPN protocol based on OpenVPN called Chameleon. Chameleon takes the metadata from OpenVPN and adds an extra layer of disguise. The purpose of this is to beat censorship in countries that use tools such as deep packet inspection to fish out VPN connections and block them such as China and Iran. Although I haven’t tried the mode myself in a country with heavily censored internet, independent reports online suggest that Chameleon is very good at bypassing restrictions in countries such as China. VyprVPN cover all major devices and have custom software and apps for Windows PC, Mac, Android and iOS. This is great news if you don’t want to deal with any complicated set-up and just want to get connected and secure with the minimal of fuss. The great thing about the VyprVPN software is visually it is similar across all devices. While some providers have somewhat of a mismatch between desktop and mobile clients VyprVPN have tried and succeeded at keeping things uniform. The desktop clients for Windows and Mac are identical and are some of the most user friendly I’ve come across. From the main window you can select a server (which opens in a new windows), connect and view vital statistics. Behind the scenes in the setting section there is a wealth of different options covering a variety of needs. The settings area allows you to configure options such as a Kill Switch, automatic connection on Wi-Fi networks, alter the protocol used, configure the DNS settings as well as other areas such as account settings and various log configurations. Overall the desktop software is intuitive and easy to use. If you’re a beginner or an expert then the VyprVPN software will get you connected and secured easily. The good news for mobile users is the iOS and Android apps are almost identical and look surprisingly similar to the desktop clients. I tested the Android client and found it to be equally as easy to use as the desktop clients. Like the desktop client before it, the mobile apps consist of a main screen that allows you to connect and select a server as well as providing some basic IP and status information. Since my last review of VyprVPN the mobile apps have become slightly more function rich. The Android app allows you to select between encryption modes including OpenVPN 256 bit, OpenVPN 160 bit and their proprietary Chameleon mode. A couple of other nice features on the Android app include the ability to specific DNS servers and be able to block certain websites that contain malware, a nice addition to the app that I haven’t seen elsewhere before. Again as with the desktop clients the mobile apps are easy to understand and are suitable for all abilities. Taking care of the job of protecting your mobile connection is easy and I can definitely recommend the mobile apps. VyprVPN for a long time has been one of the biggest providers in the VPN industry. While not the biggest overall in terms of countries available they are up there with the best of them. A total of 48 countries is available covering North America, Oceania, Europe, Central America, South America, Asia and the Middle East. The selection of countries available makes the service suitable for nearly every location worldwide. If there isn’t a server in the country you’re in then there will definitely be one close enough to offer good speeds. With the range of server locations it also makes the VyprVPN service suitable if you’re travelling worldwide. Regardless of the package you choose you get access to the full range of servers meaning you can stay secure regardless of where you’re travelling to. There are no data limits on the VyprVPN service and server switching is unlimited meaning you can connect and disconnect at will. Depending on the package you sign up to you’re allowed between 2 and 5 concurrent connections. Unlike some other providers VyprVPN don’t use shared IP addresses which means although they don’t log information on what you access they do store connection logs and if the IP you were using at the time is associated with an action then you could potentially be linked to that action based on connection timestamps. It should also be noted that illegal P2P use is highly discouraged and users have received warnings when downloading such content. VyprVPN offer their own encrypted DNS servers meaning the URLs you access can’t be logged by your ISP or other third party organisations which is a pleasing feature. BBC iPlayer isn’t working with VyprVPN and hasn’t been since October 2015. It appears to be one of few VPN providers that hasn’t worked to provide a solution. VyprVPN also doesn’t work with Sky Go but other UK services and some worldwide services are still accessible. Like many VPN providers accessing other Netflix regions as of the publication date of this review isn’t possible. VyprVPN is registered in Switzerland which makes them a good choice for users wishing to avoid US based providers and those based in five-eyes countries. When I reviewed VyprVPN back in early 2015 their servers speeds were a mixture of average to disappointing results. I personally struggled to get any half decent speeds from their UK servers for a long period of time. I’m happy to report that the speeds from VyprVPN while not at the top of the tree have been gradually improving over recent months. Their UK server alone has doubled in speed for myself in the last 12 months and in my monthly UK server speed tests they continue to be working their way up. Everyday browsing, video streaming and other general internet tasks caused no problem on the VyprVPN service. I could quite easily connect and leave the service running without any issue. To put the service through its paces I took a selection of nearby servers and downloaded a 10GB test file. I used a Windows 10 system with the custom VyprVPN software. I also made use of OpenVPN with 256-bit encryption and the UDP protocol. All testing was carried out on Friday 18th March 2016 between 11:00 and 12 noon. My connection speed without VPN at the time of testing was 210.57 Mbps. As the results show VyprVPN isn’t the fastest VPN provider but nor are they the slowest. In comparison to other providers they sit somewhere in the mid-range speed wise and for general everyday use all servers tested would be more than suitable. Since my last review the overall speeds are a great improvement, especially the UK server. 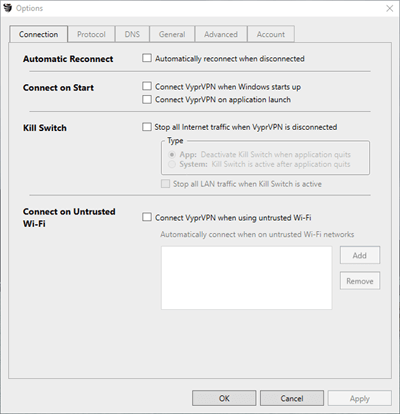 VyprVPN’s 256-bit OpenVPN connection uses AES-256-CBC initialized with 256 bit key. The control channel uses TLSv1, cipher TLSv1/SSLv3 DHE-RSA-AES256-SHA with a 2048 bit RSA key. PPTP makes use of 128-bit encryption with L2TP/IPSec utilising 256-bit. The policies from VyprVPN are straightforward and easy to interpret. One important aspect to note is copyright material is not allowed to be downloaded or distributed through the VyprVPN service. Being a large corporation and not utilising shared IP addresses will result in you being warned if you’re caught downloading copyrighted material. Repeat copyright infringement will see your account terminated without refund for any remaining time left on your subscription. The good news is VyprVPN won’t log or store any of your activity nor use any type of deep packet inspection to determine what type of traffic you’re transferring. They are network neutral meaning you won’t find speeds restricted for using certain types of applications or services. Aside from the usual terms and conditions there is nothing especially noteworthy to report. Like all providers, it’s important for you to read through their policies yourself to determine if their service is suitable for your needs. Support is available via support ticket or via the live help system. VyprVPN is one of few providers that offer 24 hour live support via their website. If you’re new to VPN services or you just get stuck at some point then having live support on hand regardless of the time of day is an excellent feature and definitely a bonus of the VyprVPN service. VyprVPN offer a range of packages to suit various needs. The VyprVPN Basic package is rather pointless and for the price best avoided. Only offering PPTP the service isn’t really secure enough for this day and age and it’s about time the package was done away with. I recommend looking at their Pro or Premier package if you’re interested in protecting your privacy. The monthly costs of the VyprVPN service are actually at the higher end and so it’s worth considering an annual package where some massive savings of up to nearly 50% can be found. By taking an annual package the prices are more competitive with what else is available on the market. VyprVPN is suitable for your range of devices as they support Windows PC, Mac, Android and iOS with custom software and apps. All four apps are aesthetically similar allowing you to transition from one to another without any issue. Both their software and apps are well put together and easy to use so if you’re a beginner you won’t have any trouble navigating around to get connected. A total of 48 countries is available to connect to which is more than enough for most regions in the world. With such a large range of locations the service is open to residents of most countries and if you’re travelling they’ll also come in handy. VyprVPN have private DNS servers making their service that little bit more secure and you’re free to switch servers and transfer as much data as you wish. Depending on the package you sign up for you can use the service on between 2 and 5 devices concurrently. If you’re after using BBC iPlayer, Sky Go or accessing Netflix regions then unfortunately as of the publication date of this review they’re not working with the VyprVPN service. Speeds achievable on the VyprVPN service have continued to increase over the past year and I’m pleased to see them offering more reliable and robust speeds than my previous review back at the start of 2015. 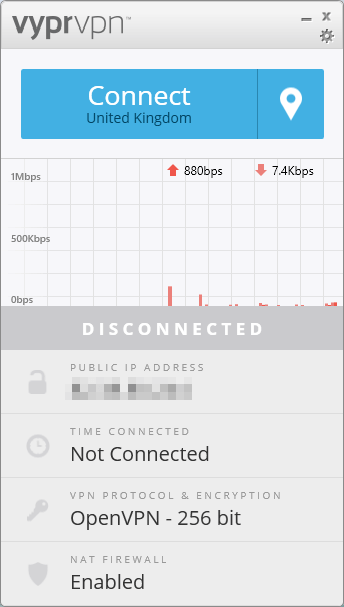 While not at the top end of the scale speed wise they do offer speeds that will allow you to carry out nearly every internet task without being aware the VPN service is running in the background. Overall VyprVPN offer a very reliable VPN service with a wealth of features that you would look for in any commercial VPN solution. 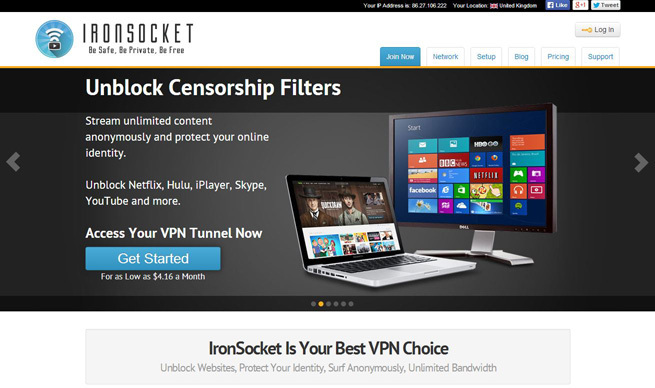 A great VPN service and one well worth signing up to if their range of servers and other features are suitable for your needs.